Click here to check out our Oscars site. The Artist really deserved the win. I’m so sick of this artist movie. It totally should’ve gone to one of the other nominees…I even would’ve been happier with that Hugo one! Yay Captain Von Trapp! I’m so happy he and Octavia Spencer won. I would have like Viola to win (since I’ve only seen The Help out of all the nominees) but I love Meryl Streep so good for her. And again, I havent seen anything besides the Help so I’ll just say good for The Artist, Hazavanicius, and Jean. However, and Im sorry if you disagree, but HP7 and Planet of the Apes got ROBBED. WTF?! HUGO for best visual effects? The academy sure as hell has lost touch with their audience. 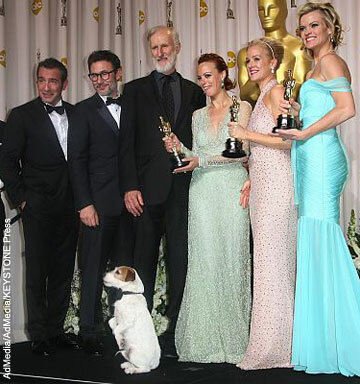 Dogs don’t get Oscars…people do. Or Muppets.